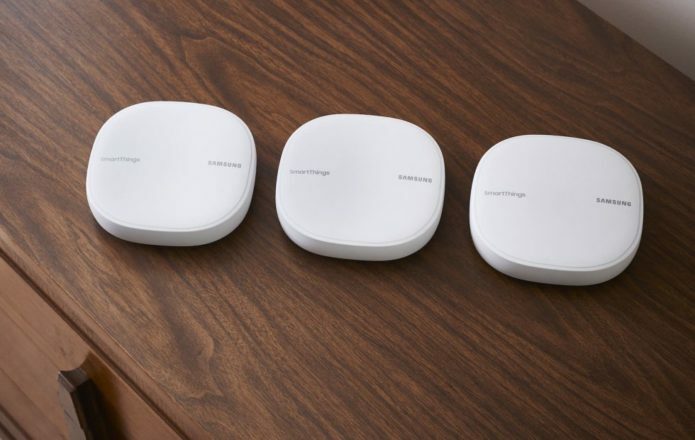 Samsung wants to tame your smart home and end your WiFi deadspots, with its new SmartThings Wifi mesh router system. Promising not only smoother internet access for things like online gaming, streaming media, and general browsing, the mesh networking system also integrates an IoT hub that could leave you spending less time jumping between apps and more time letting your connected home do the hard work in the background. Two reasons, really. The first is that perennial issue facing most modern homes: eliminating WiFi deadspots. As we’re more and more reliant on wireless networking, so the frustrations of brick walls, multiple floors, and generally wirelessly-inhospitable construction have grown. That’s where mesh networks come in. Rather than one single, high-powered router – preferably placed somewhere central – you have multiple, smaller units. Each communicates with the other, and the group is seen by devices as a single, harmonious WiFi network. In the background, though, they intelligently adjust which unit your laptop, smartphone, tablet, console, or other device is connected to, to maximize your connection speed and minimize latency. Since you can add extra units – SmartThings Wifi comes as a three-pack, but you can add more – you can expand coverage for larger properties, or focus a little extra on a tougher location, such as in a basement. The other reason to be interested in SmartThings Wifi is the smart home. Just as the name implies, Samsung has baked in an IoT hub, using the SmartThings technology it acquired a few years back. SmartThings has a range of accessories of its own – there’s a motion sensor, outlet plug, water leak sensor, and multipurpose sensor, among others – but what really makes it powerful is how nicely it plays with third-party devices. So, if you have Hue lights, or a Yale smart lock, or a Honeywell thermostat, or any one of a long list of IoT-enabled, connected devices at home, you can pair them to the SmartThings hub. That means you can control them all together from the SmartThings app, rather than jumping between different, individual apps, as well as combine multiple actions into cross-platform macros. SmartThings Wifi isn’t the only new networking device Samsung has on the books today. The company has also launched a new version of the SmartThings Hub, for those who already have a router system they’re happy with, or who just want to corral their smart home devices for as little cash outlay as possible. So, for $69.99 you don’t get the mesh networking cleverness, but you do get a smart home hub capable of bringing together many different IoT gadgets under the same umbrella – and app. This latest hub has Z-Wave, Zigbee, and Bluetooth, but can also use WiFi to connect to your router-of-choice. That’s a lot more convenient than the old system, which required an ethernet cable between the two. How is SmartThings Wifi different to Samsung Connect? This isn’t Samsung’s first ride in the mesh networking rodeo. The last generation was launched as Samsung Connect, and looks pretty much identical to these new routers – bar the SmartThings logo on top. You probably won’t be surprised to hear that the similarities continue inside. Both offer 802.11a/b/g/n/ac WiFi with 2×2 MU-MIMO support, for maximum AC1300 speeds of 866 Mbps at 5 GHz, or 400 Mbps at 2.4 GHz. Each unit can cover up to 1,500 square feet, and each has support for both Z-Wave and Zigbee, the popular home automation wireless standards. You get two ethernet ports on the back, along with Bluetooth inside. Indeed, the primary difference between Samsung Connect and SmartThings Wifi is Plume. It’s used to automatically control traffic management, adjusting how different WiFi frequencies and channels are used to make sure you get maximum speed and range for whatever you’re doing. It also includes parental controls and guest network support, along with network diagnostics. If Plume’s talents aren’t enough for you, how about a far more impressive sticker price? Samsung Connect was around $380 for a pack of three mesh units. In contrast, Samsung’s SmartThings Wifi mesh router three-pack is $279.99. That’s a big saving: indeed, for the price difference between that old generation and this one, you could almost buy a fourth SmartThings Wifi unit and give yourself another 1,500 square feet of coverage. It also makes it much more competitive with other mesh router systems out there. The well-considered Google Wifi, for instance, is currently $289 for a three-pack. What about the Samsung Galaxy Home? Samsung’s oddly-shaped smart speaker made its debut alongside the Note 8 last week, and while its primary function may be playing music and using Bixby to answer your questions, it also has SmartThings baked in. In fact, not only will the Galaxy Home be SmartThings-compatible, it’ll be a hub for the IoT system in its own right. If you’re not already on the SmartThings train by that point, the Galaxy Home will do just fine at bridging your WiFi, Zigbee, and Z-Wave devices. However Samsung is yet to confirm when, exactly, its smart speaker will hit shelves, or indeed how much it will cost. Whatever that number ends up being, we’d be very surprised if it’s as cheap as the new SmartThings Hub, or even the $119.99 you’ll pay for a single SmartThings Wifi mesh router unit. It’s worth remembering that Zigbee and Z-Wave devices only work with a single, primary controller. If you have more than one hub, a smart device using either of those connectivity methods will only be able to communicate with one of them. However, both Zigbee and Z-Wave use mesh networking, with the ability to expand coverage themselves by piggy-backing signals through each connected device.